"I have to re-create the universe every morning when I wake up, and kill it in the evening." "Iceland sets a world-record. The United Nations asked people from all over the world a series of questions. Iceland stuck out on one thing. When we were asked what do we believe, 90% said, 'ourselves'. I think I'm in that group. If I get into trouble, there's no God or Allah to sort me out. I have to do it myself." "It takes a long time to fully become who you are." "Emotions weren’t created to just lie around. You should experience things to the full. I’ve got a sense of the clock ticking. We have to feel all those things to the maximum. Like, I don’t eat a lot but I really love eating. And I like being precise and particular. There is a certain respect in that. If you can do your day depending on how you feel, and enjoy things as well." Hello Hi, I am Lyscii. I've seen myself as a Satanist for a bit over 3 years, generally having a LaVeyan view of things, but not quite wanting to pin myself down with that label. The last year has been difficult for me, one could say in some ways I've been beaten down mentally and physically into a pile of mush. But hey, mush seems like a perfect formless substance to shape into whatever form I desire to take. And I see all sorts of possibilities, who I can be, what I can focus on in life, how I want to shape my subjective universe, and so on. Now I've assigned myself the task of exploring these possibilities, and figuring out what will work best for me. I read Black Magic by Michael Aquino two months ago, and was amazed to see ideas I was just starting to think about not only fleshed out, but expanded upon greatly. Despite being rather short in length, it took awhile to read. At times I was stopping every few sentences to ponder the full meaning of what I had just read. Since then I've grabbed a number of books from the ToS reading list. 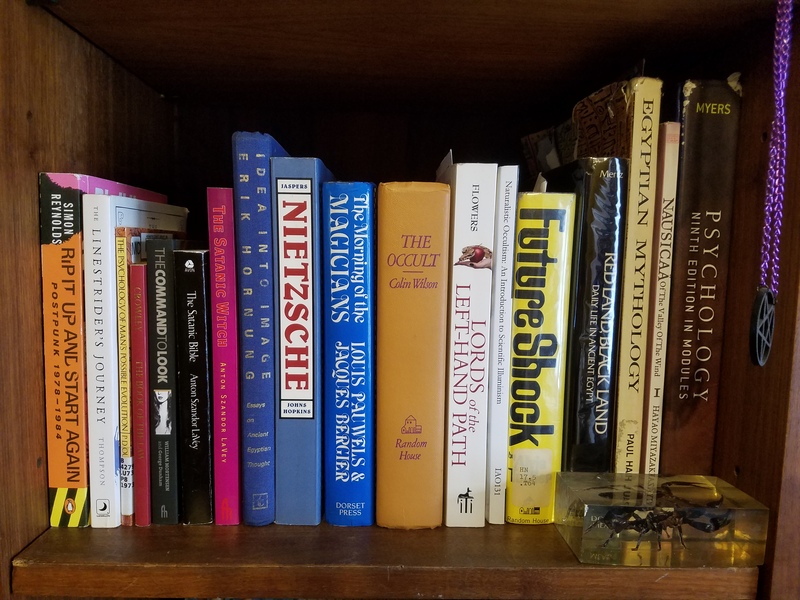 I figure a good way to end this introduction is to show off a shelf of books, some I have read, some I'm in the middle of, and some I plan to read soon. Re: Hello Thanks for the welcome everyone. @Onyx I haven't had the chance to read through The Command to Look yet, but have flipped through the back half where all the photos are. I'm seriously impressed with Mortensen's work. I love how many of his photos look more like paintings. @Xepera maSet I'll be grabbing your book sometime soon. @Beetle I do find it rather interesting that someone on a LHP forum would not see anything to their liking on that shelf. How many of those books have you actually read? What relevant book would you recommend? @Cabshear The concept of Vampirism does hold a bit of interest to me, what would be your recommendation if I wanted to find out more? Re: Revolutionary Ideation and LHP 1. If you had to describe your relationship with the ruling powers of your society as you understand them, would you say that you are aligned with them, opposed to them, or indifferent to them? Passive. While the idea of revolution does have some appeal in my head, I realize that most people around me are too apathetic or brainwashed for it to be a reality anytime soon. And revolutions don't have a history of always getting the desired result. 3. Do you think that citizens live in fair and equitable circumstances under the current ruling powers? 4. Do you think a better system than the current one could be created in terms of the welfare and circumstances provided to the citizen? If so, what do you think the chances are of this coming about? Absolutely. The government could do a lot more for the average citizen if we weren't wasting our resources killing people overseas or giving money to oil companies, among other things. I think it's possible we will see a few steps taken in the right direction after the 2020 election, but it won't be anywhere near enough. 5. How long do you think the power structure of your society will last before being destroyed or reformed into something radically different? 25-80 years. I don't think our current crisis will topple it. Pressure from climate change and resource scarcity will grow and grow as time goes on, but I see our system clinging on as long as it possibly can. 6. Whether you are in alignment with, opposed to, or indifferent to the ruling powers of your society, do you think that political violence is ever justified or necessary to advance these views? I have yet to form a solid opinion on this. I personally don't have plans to be involved in violence unless I feel it is truly necessary for my own well being. 7. In your experience, does LHP ideology push people in one direction or the other (in terms of evaluation of political leadership). Alternatively, has it done so for you? My impression is most LHP people are more critical of individuals in power, whatever view they have of the system as a whole. I feel like I'm a bit more informed than the average idiot when it comes to politics, but not up to the level of most of my peers. As I start to take LHP thought more seriously, I feel inspired to study politics to better my understanding of the world around me, and to actually be capable of defending whatever positions I may hold. Re: Animal sacrifice I have no extra problem with someone ritually sacrificing an animal if they were already planning on eating it, as long as it is done in a humane manner. I've got no plans to do so myself, since I'm a vegetarian. I don't need to have animals killed to sustain me. Re: Can one worship Satan and other pantheons? Quasi-Theism could apply to my point of view as well. I have yet to see anything that convinces me that any deity exists in the objective universe as anything more than an idea in the minds of humans, along with all the depictions that are in art and literature that result from this idea. But these ideas still exert an influence on us, changing our thoughts and actions. Whether or not Yahweh exists, millions of people have been killed in his name. I can perceive and interact with my interpretation of a deity, which varies from someone else's interpretation. I can do this and recognize that it is entirely possible that it is all in my head, but this doesn't have to reduce it's meaning.